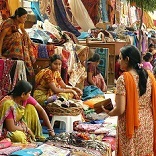 NEW DELHI: Traders body CAIT asked the government to set up a regulatory body for retail sector to ensure healthy competition in view of entry of big corporates in the segment. After entry of big corporates like Reliance and Future Group, small traders are facing tough competition. The association has strongly opposed entry of big corporates and foreign players in the multi-brand retail. The UPA government had permitted 51 per cent FDI in the sector. He added that the government should frame a policy with a view to promote 6 crore small trader community in the country. He also requested the government for early implementation of Goods and Services Tax.